Aroma is Israel’s largest coffee chain, and is expanding internationally - last year they opened in New York and now they have just opened in Canada, and are looking to open in Europe in the near future. If this wasn't enough reason to boycott and picket their cafe's, there is plenty more - the more you learn about Aromo the worst the wiff becomes. They are guilty of opening their cafe's in the illegal settlement of Maaleh Adumim, therby directly going againt international law and helping sustain illegal settlements in occupied territories. "Do you see the color of my skin? I'm white and you're black, and I'm going to screw you. This white will teach you a lesson, you're a black stain, a black, inferior woman - you're nothing, and I make $800 a minute"
Technically co-founder/co-owner as Aroma was founded by two brothers - both were not involved in the assault. TORONTO — Israel’s answer to Starbucks will open its first Canadian location in Toronto this week amid threats of boycotts and a possible protest by an anti-Israel group. “People are aware that it exists and people are aware that it’s opening. We’re encouraging our members to boycott it,” said member Lisa Schofeld. The Toronto cafe is Aroma’s first foray into Canada. It has 72 locations across Israel, with 40 new franchises expected in the next four years, including one in Romania. Other than its savoury Bureka pastries — and the fact that its beans are roasted and blended in Israel - very little else would suggest that the Toronto espresso bar is tied to an Israel-based corporation. And that’s the way managing partner Anat Davidzon, 26, would like to keep it. The Aroma Israel café chain, owned by Yariv Shefa, is expanding abroad. The chain will open its first Canadian branch in Toronto with a $1.5 million investment. The new branch will be run by Anat Davidson, who underwent training in Aroma Israel. Aroma Canada will operate in partnership with Canadian businessman Earl Goldman, who received the franchise for all of Aroma's future branches in the country. Aroma is also set to begin operations in Europe soon, and is planning the launching of its first European branch in Romania in the near future. 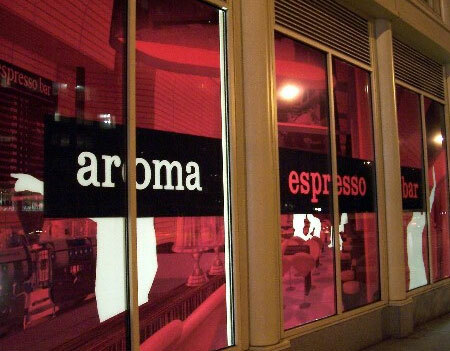 Last year, Aroma opened its first overseas branch in Manhattan. Do you see the color of my skin? I'm white and you're black, and I'm going to screw you. This white will teach you a lesson, you're a black stain, a black, inferior woman - you're nothing, and I make $800 a minute. Sahar Shefa, the owner and founder of the Aroma coffee, speaking to a woman of North African / Middle Eastern origin. Sahar Shefa, the owner and founder of the Aroma coffee chain in Tel Aviv, who stirred a public row after cursing a Colmobil employee, Mali Shalev, apologized to Shalev Thursday and agreed to pay her NIS 100,000 (roughly USD 23,000). Last week, the court found Shefa guilty of slander. The compensation agreement is pending the court's authorization. Colmobil, Mercedes' importer in Israel, and was asked to wait for a while until the company's employees return from a conference they were attending. When Shalev arrived at the place, Shefa shouted at her: "You see my skin color? I'm white and you're black, I will screw you, this white guy is going to teach you a lesson, you are a black stain. You are a black and inferior woman. You are an idiot. You're nothing and I make 800 dollars a minute." On Thursday, Shefa said: "The things I said are inappropriate in every way, they go against the values on which I was brought up and according to which the Aroma chain is being run. I sincerely apologize." Shefa and Shalev held a long conversation, in the course of which Shefa apologized for his words, expressed his deep regret, and presented to Shalev the various social activities sponsored by the chain. I write to you as someone who has been protesting outside of Aroma Espresso Bar in New York City. 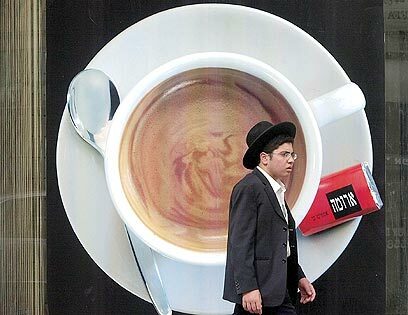 As you probably know, Aroma is Israel’s largest coffee chain, with 73 locations and growing. 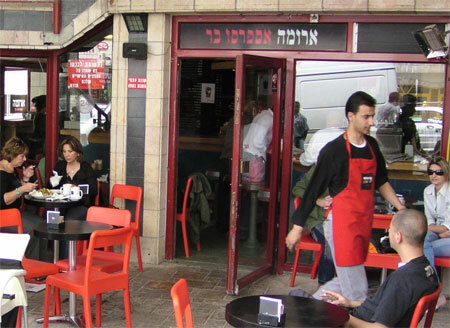 As you point out in your blog entry, “Meet Me for Coffee”, this includes locations in Tel Aviv and Jerusalem. But you don’t mention that Aroma also has a cafe located in Maaleh Adumim, an illegal settlement in the West Bank (by “illegal,” I simply refer to the standard of international law, which is clear about the illegality of permanent settlements in occupied territories). I’m certain that we differ on many things, but it seems that we share a desire that cafes in this city, and in this country, become places full of open political debates (though preferably not the mega-chains that crush smaller cafes and local commerce). From this tiny patch of common ground—even if the commonness is only rhetorical—I want to offer you an explanation as to why I can’t accept your invitation to coffee at Aroma Espresso Bar. Now, like many of the people who have been protesting outside Aroma, I happen to be neither Palestinian nor Muslim. My opposition to the actions of the state of Israel has nothing to do with my own religious background or ethnicity, and I would hope that your own religious commitment and “romantic relationship with time in Israel” (as you put it in your blog entry) would not necessarily prevent you from criticizing the actions of the Israeli government in the name of larger ethical and moral principles such as human rights. The more important point has to do with the danger of other sorts of preconceptions. Here is another one, from your piece: “There are certainties: this is a war over Israel’s existence.” I like your writing style, Rabbi Bachman, but you know as well as I that rhetorical certainty too often stands in for logical coherence. I’m an English teacher, so I think about this a lot, and whenever I read a sentence that begins with words like “certainly” or “of course” or “clearly,” whether it’s in a student paper or a newspaper article or a politician’s speech, I narrow my eyes and expect the worst. My skepticism is, unfortunately, all too often rewarded, and so it is in this case. It is far from “certain” that a massive Israeli air, marine, and ground attack that has thus far killed at least 1,287 Lebanese people, nearly all civilians, wounded 4,054 others, caused an estimated $3.6 billion of damage to Lebanon’s infrastructure, and drove tens of thousands from their homes and cities and villages, can ever be justified. Nor can its aftermath, including the strewing of hundreds of unexploded cluster bombs throughout south Lebanon, which join the unexploded mines left behind by the Israeli army’s previous occupation. Nor the environmental disaster caused by the Israeli bombing of the power station at Jiyeh, which spilled 10,000 tons of heavy fuel into the Mediterranean Sea—“the biggest environmental disaster in the history of the eastern Mediterranean,” as one environmental group has called it. Whatever existential concerns you and others might have about the state of Israel, the result, in this instance, has been to make existence for people throughout Lebanon impossible. As evidence, I would be prepared to send you the harrowing posts that I received from friends in Lebanon during the thirty-four-day siege—teachers, students, artists, all of them lovers of cafes and of political conversations, all of them opposed to attacks on civilians under any circumstances—as they watched the world around them bombed out of existence. His demeanor confirmed the impression I had after speaking to him on the phone. Maher had seen the face of death. Not death as in the sorrowful but inevitable expiring of everyday life, and not the death of a soldier on the battlefield. He had seen the face of organized, carefully orchestrated, mass-scale death, the planned death of hundreds and thousands as a solution to restoring power hegemony in a region. You never leave a mass grave unscathed. Maher had seen several that day. Even if helping survivors seems like a life-affirming release, it will not alleviate the burden, the imprint of the face of death. I know he has been branded forever now and there is not much anything that can be done about it. Can you fail to be moved by such words? Can anyone? Could an avowed teacher and humanist such as yourself dismiss the destruction of Lebanon as a “necessary evil”? Or the recent Israeli air strikes in the Gaza Strip that destroyed the electricity grids there, leaving more than 200,000 Palestinians suffering, during the hottest days of August, from power outages for 16 hours a day, while 88,000 others are deprived of potable water? Production in the ice cream factories of Gaza bravely brought to a halt: is this really an image from a struggle for Israeli survival? 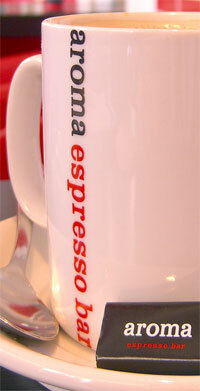 Aroma Espresso Bar in Israel, locations include the illegal settlement of Maaleh Adumim. This particular version of unilateralism, with the concomitant dehumanizing of “enemies” who are constantly out to destroy “us,” is all too familiar to those of us in the United States as well. The Bush administration claimed that its war in Iraq was a war necessary for the survival of the nation. We are by now all too familiar with the absolutely fraudulent nature of that claim and, more important, with the inconceivably massive damage it has brought upon the people of Iraq, more than 10,000 of whom have been killed in the last four months alone. It is for this reason that those of us who stand and protest outside of Aroma are also among the hundreds of thousands of Americans who protest the continuing U.S. occupation of Iraq and Afghanistan, and the threats of further U.S. state terror against Iran and Syria. It is the reason why I, like others in the United States who support worldwide boycott, divestment, and sanctions campaigns aimed at Israel’s continuing occupation and violations of international law, also support such campaigns by individuals and groups around the world aimed at U.S. occupations and violations. For this is the real point: in our world of nation-states, states have a right to exist, but they do not have the right to exist in any way they choose. States that consistently threaten and attack their neighbors, carry out illegal occupations, and impose unequal standards of citizenship upon those living within their borders deserve to be sanctioned. Otherwise, the very notion of justice becomes meaningless, and we are left with a world governed by nothing but brute force. Is this the world you would like to inhabit or leave to your children, Rabbi Bachman? Beginning with the violent dispossession of Palestinian refugees in 1948, the international community has refused to hold the state of Israel accountable for its crimes against the Palestinian people, crimes that did not begin with but were enormously exacerbated by the illegal occupation of the West Bank and Gaza since 1967. The number and extent of the violations are staggering, but I will not bore you with the details, since they are readily available and have been widely documented. I will note just one instance: in July 2004, the International Court of Justice ruled that the “separation wall” being built by the Israeli government in the occupied West Bank was in complete violation of international law, and called on the international community to oversee its immediate cessation and dismantlement. Needless to say, nothing of the sort has occurred, and in fact the Israeli government has intensified and sped up work to complete the wall. During the recent attack against Lebanon, the UN showed itself to be once again helpless to stop or sanction the Israeli government, thanks to the unwavering support of the United States. Nor has there been any attempt to hold Israel to the terms of the cease-fire: according to UN reports, since it was implemented on August 14, Hezbollah has violated the cease-fire four times, while Israel has done so nearly 70 times. This in fact reflects the larger pattern since the July 2000 withdrawal of Israeli troops from southern Lebanon, in which Israeli forces repeatedly and willingly violated Lebanese territorial and air space. While this does not in itself provide an excuse for Hezbollah’s capture of two Israeli soldiers, the putative “cause” of the Israeli massacre that followed, it provides the necessary context for understanding this act as part of an ongoing series of border clashes in which Israel was more often than not the one violating the international border and, thus, international law. And this brings me to why we are standing and protesting outside Aroma Espresso Bar, Rabbi Bachman. When governments remain unaccountable, and international institutions refuse or are powerless to act, the job of confronting injustice falls upon the people of the world. Economic boycotts have been, throughout the past century, one of the few non-violent weapons of the weak. African-Americans in the United States have been the victims of systematic violent racism since the times of slavery and have been resisting this racism since its inception; but it took actions such as the Montgomery bus boycott, sit-ins at segregated restaurants and institutions, and other acts of civil disobedience to bring national and international attention, and led to some of the civil rights movement’s most important gains (gains that have not ceased to come under attack since then). In South Africa, non-whites had been the victims of an apartheid state for decades, but it took the launching of the worldwide anti-apartheid campaign of boycotts, divestment, and sanctions by South Africans and international supporters to bring international attention to the horrors of apartheid and help bring it to an end. The occupation of the West Bank and Gaza by Israel will enter its fourth decade next year. The denial of justice to Palestinian refugees and their descendents has lasted nearly six decades. We stand in protest outside Aroma Espresso Bar because we believe that a worldwide campaign of boycott, divestment, and sanctions aimed at Israel’s policies, initiated by Palestinians struggling against the occupation and carried out together with people of conscience from around the world, will at last galvanize world public opinion and force the political changes necessary to end the occupation and bring justice to all those living in Israel-Palestine. Key to this will be the transformation of the state of Israel from a state whose policies are based in apartheid to a truly democratic state of all its citizens. But why, of all places, must such a protest focus on a cafe? Even when a cafe is not ringing with voices engaged in political discussions, politics is still there in the room, in the most material sense. This has been true as long as there have been coffeehouses: in the eighteenth and nineteenth centuries, C. L. R. James informs us, British and French abolitionists refused sugar in their coffee to protest the slave plantations of the New World that produced Europe’s sugar. Closer to home, people in the United States have for decades protested against companies whose coffee plantations in Central and South America have been inextricably linked to brutal U.S.-funded military and paramilitary violence in Colombia, El Salvador, Guatemala, Nicaragua, and elsewhere. Today, the fair trade movement works to end the exploitative practices of international coffee companies in Africa and Central and South America and attempts to foster economic justice for local producers. If you want to talk politics, Rabbi Bachman, you need to look no further than your cup of coffee. Even for those who are sympathetic, a boycott of a coffee chain may seem strange and even a bit silly when compared to, say, a boycott of the companies that produced the bombs that fell on the children of Qana or the bulldozers that tear apart homes in the refugee camps of Gaza (don’t worry—there are plenty of campaigns in the U.S. and throughout the world against these companies too). But all Israeli companies, and especially large chains such as Aroma, benefit from the use of stolen land, resources, and cheap labor from the occupied territories, prevent Palestinian trade and economic development, and use the occupied territories as a captive market. All these companies thereby benefit from the occupation. And businesses such as Aroma that operate in the settlements of the West Bank actively support and sustain the occupation. To sum up: as long as occupation is business as usual for Israel, there can be no business as usual with Israel. 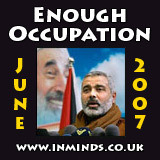 As long as the occupation, dehumanization, and dispossession of Palestinians continues; as long as Israel continues to threaten and attack its neighbors with impunity; as long as the policies of the state of Israel continue to impose a condition of apartheid upon those living within its borders and the territories it occupies; and, in particular, as long as the government of the United States continues to provide the unconditional military, economic, and political support that keeps Israel beyond the bounds of accountability, either to the international community or even to its own citizens—in other words, until these violations end and justice begins, an economic boycott, together with calls for divestment and sanctions and other non-violent actions from below on the part of people from around the world, will continue. It is from such small but unshakable origins that global social movements take their beginnings. It is with small steps that the world is made, slowly but surely, to change. Here’s my own utopian vision: someday you might come out and join us. We’ll bring the coffee. Anthony Alessandrini is an Assistant Professor of English at Kingsborough Community College/CUNY in Brooklyn, and an organizer with the Action Wednesdays Against War collective. He can be reached at tonyalessandrini@yahoo.com.